2. PLC is used for automatic control, four shaft servo linkage, reliable performance, convenient to operate, and fully automatic. 3. High degree of automatic. machine can finish packing at one time from longitudinal sealing, longitudinal cutting, transverse sealing, filling, embossing, notch cutting, cutting dotted line, transverse cutting to output finished sachets. 4. High precision whole rolling type heat sealing roller are adopted as sealing mould. 4-side sealing, single line or double-line sachets form. Because catsup material will easily leak in sealing side, an extra smooth striated sealing roller is setup to ensure sealing sides compact and tightly, with high packing speed, smooth bag shape, delicate and beautiful, packaging with high efficiency. 6. Accurate in measurement, according to different paste viscosity, specifically designed of reciprocating plunger pump with rotate valve controlling, matched with stroke adjustment air cylinder feeding, each line's dosage can be adjusted easily and accurately. 7. Each actuating mechanism adopt servo motor to driver, bag in forming process through the PLC control, make each actuating mechanism precise automatic synchronization positioning. 8. Photoelectric tracking system is adopted to ensure correct printing and with automatic counting function. 9. 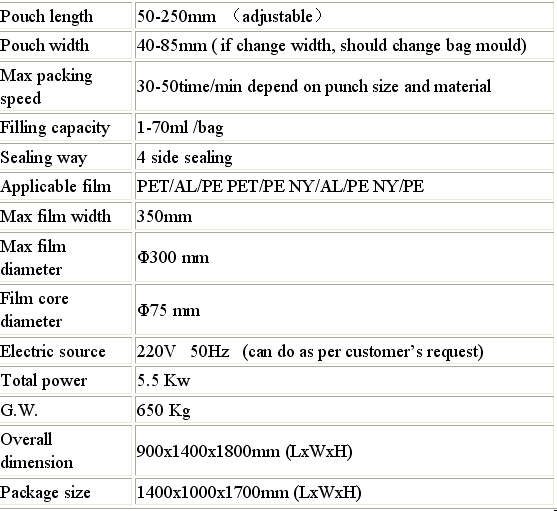 Adaptability of the package film. The sealing temperature of machine is with automatic control, and with high control accuracy (± 1C °). Suitable for most complex film packing film in home and abroad, as PET/AL/PE,PET/PE,NY/AL/PE,NY/PE and so on. 10. Extra function set up, for example, sachet cutting can can choose dotted line knife, flat cutting knife or saw tooth knife. Printing can choose embossing(hard batch) or ink wheel printer.And the matching of alarm requirements and so on. Suitable for packing catsup, thick paste material in the pharmacy(medicine), food, daily chemical and other industries, automatic packing into sachet with measurement requirement, such as peanut oil, salad oil, tomato paste, cough syrup; Shampoo, oil, Vaseline, creams of all kinds, and much more. Looking for ideal Automatic Ketchup Packing Machine Manufacturer & supplier ? We have a wide selection at great prices to help you get creative. All the Automatic Shampoo Packing Machine are quality guaranteed. We are China Origin Factory of Plant Oil Packing Machine. If you have any question, please feel free to contact us.